Correlation coefficient is a quantity that measures the strength of the association (or dependence) between two or more variables. Kendall tau: rank-based correlation coefficient (non-parametric methods). Recommended if the data do not come from a bivariate normal distribution. Spearman rho: rank-base correlation coefficient (non-parametric methods). Recommended if the data do not come from a bivariate normal distribution. $x$ and $y$ are two vectors of length $n$ $m_y$ and $m_y$ corresponds to the means of $x$ and $y$, respectively. by using the correlation coefficient table for the degrees of freedom : $df=n-2$, where $n$ is the number of observation in x and y variables. 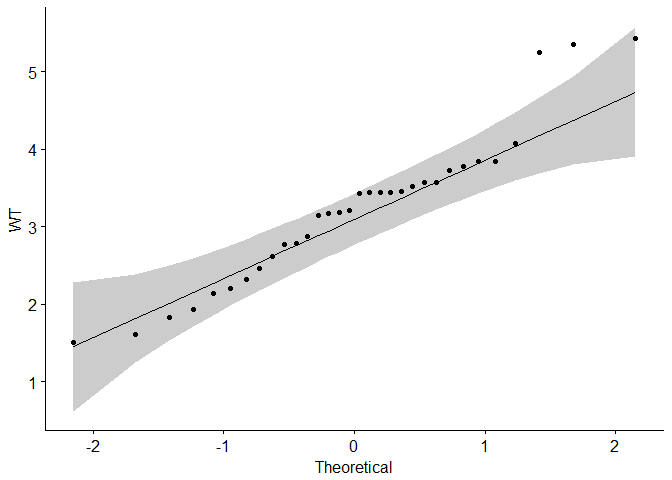 If the p-value is < 5%, then the correlation between x and y is significant. The Spearman correlation method computes the correlation between the rank of $x$ and the rank of $y$ variables. Where $x’ = rank(x_)$ and $y’ = rank(y_)$. The Kendall correlation method measures the correspondence between the ranking of x and y variables. The total number of possible pairings of x with y observations is $n(n?? ?1)/2$, where n is the size of x and y. Begin by ordering the pairs by the x values. If x and y are correlated, then they would have the same relative rank orders. Now, for each $y_i$, count the number of $y_j > y_i$ (concordant pairs (c)) and the number of $y_j < y_i$ (discordant pairs (d)). 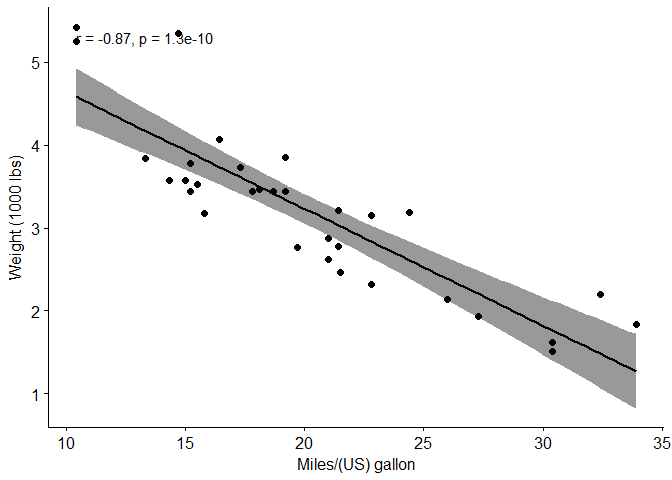 cor.test() test for association/correlation between paired samples. 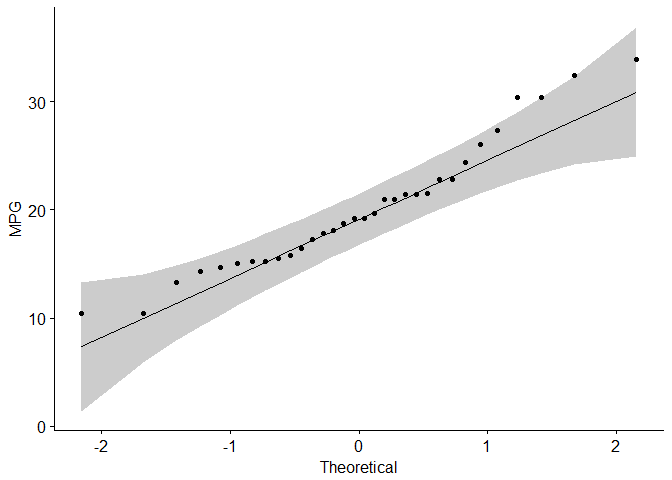 It returns both the correlation coefficient and the significance level(or p-value) of the correlation. Is the covariation linear? Yes, form the plot, the relationship is linear. In the situation where the scatter plots show curved patterns, we are dealing with nonlinear association between the two variables. Are the data from each of the 2 variables (x, y) follow a normal distribution? #Q-Q plot draws the correlation between a given sample and the normal distribution. If the data are not normally distributed, it’s recommended to use the non-parametric correlation, including Spearman and Kendall rank-based correlation tests. 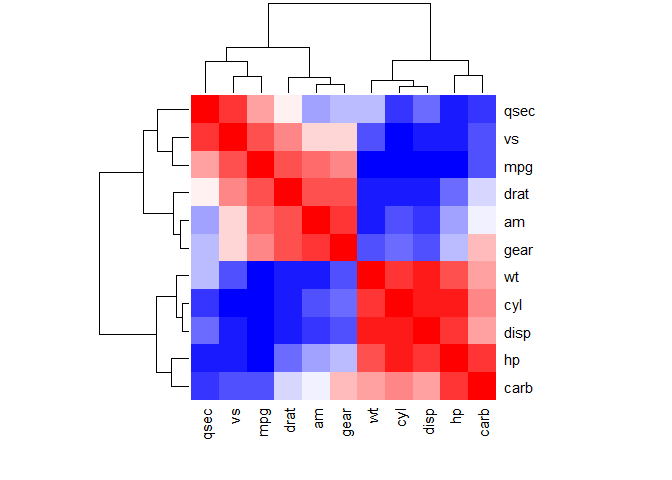 Function rcorr from Hmisc package used to return correlation coefficients and the correlation p-values, function ggcorrplot from ggcorrplot used to visualize correlation matrix. Method two: function ggcorr() in ggally package. However, can’t reorder matrix and display significance level. Method four: ggcorrplot() function from ggcorrplot package. 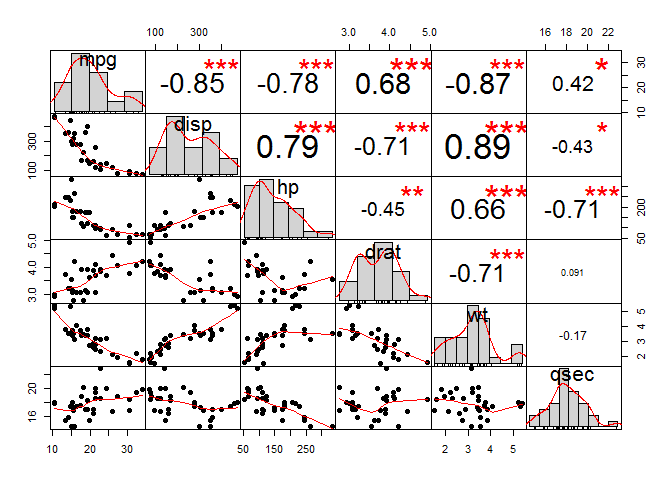 Functions: reordering, displays significance level, computing a matrix of correlation p-values. 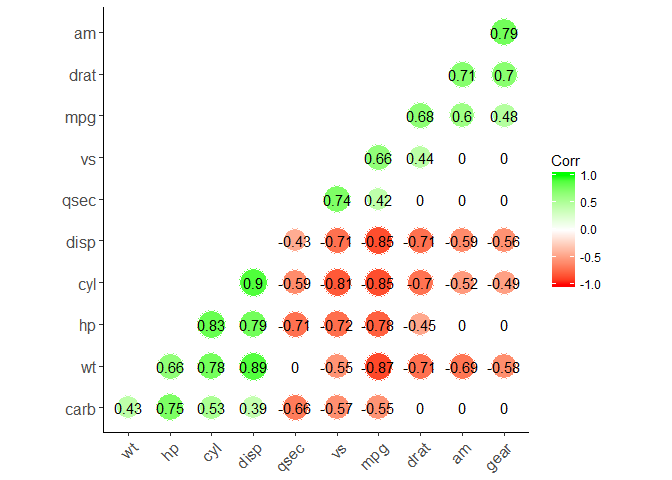 cor() return correlation matrix; cor_pmat() in ggcorrplot package computes a matrix of correlation p-values. The function rcorr() [in Hmisc package] returns both the correlation coefficients and the correlation p-values for all possible pairs of columns in the data table. P: the p-values corresponding to the significance levels of correlations. x: numeric matrix or a data frame. method: indicates the correlation coefficient to be computed. - pearson(default): measures the linear dependence between two variables. - kendall: non-parametric rank-based correlation test. - spearman: non-parametric rank-based correlation test. use = "complete.obs": case-wise deletion, which is useful for NA-containing matrix. 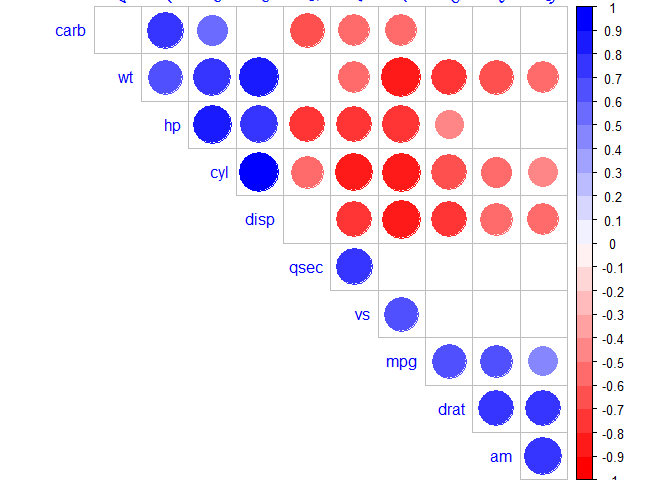 corr:	The correlation matrix to visualize. To visualize a general matrix, please use is.corr=FALSE. method:	seven visualization method: "circle", "square"", "ellipse", number", "shade"", "color", "pie"
order: reorder the correlation matrix. The correlation matrix can be reordered according to the correlation coefficient. This is important to identify the hidden structure and pattern in the matrix. tl.srt: for text label string rotation. used to change label rotations. chart.Correlation() in package PerformanceAnalytics can be used to display a chart of a correlation matrix. #The distribution of each variable is shown on the diagonal. #symm: logical indicating if x should be treated symmetrically; can only be true when x is a square matrix. method = "circle",  #"square" (default), "circle"
type = "lower", # "full" (default), "lower" or "upper" display. hc.order = TRUE, #logical value. If TRUE, correlation matrix will be hc.ordered using hclust function. outline.col = "white", #the outline color of square or circle. Default "gray"
The R package ppcor provides users with four functions: pcor(), pcor.test(), spcor(), and spcor.test(). pcor() calculates the partial correlations of all pairs of two random variables of a matrix or a data frame and provides the matrices of statistics and p-values of each pairwise partial correlation. pcor.test() computes the pairwise partial correlation coefficient of a pair of two random variables given one or more random variables. 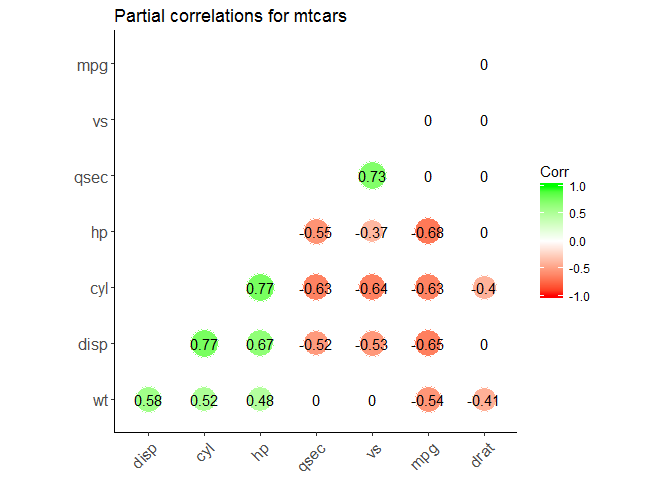 title = "Partial correlations for mtcars"